What is a Bay Day? Bay Day began in 2012 as a way to get students out of the classroom to learn about how they affect the environment around them. It started with 180 students in Botetourt, and grew to include all fourth grade students in the county! 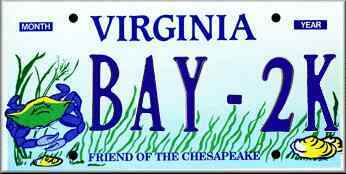 Botetourt County is part of the Chesapeake Bay watershed, hence the name Bay Day. Over two days, students rotate through four learning stations about the following topics: clean water, natural resources, soil erosion, and how pollution in Botetourt affects the Chesapeake Bay. We love getting students outside and doing hands-on learning. We want to help grow the next generation of stewards. Bay Day is made possible by a grant provided by the Chesapeake Bay Restoration Fund. ​Consider becoming a "Bayfriend" today and join the cause from your car by having personalized revenue-sharing license plate for $25 a year- with $15 going to the Fund. What is a River Day? In 2016, the land conservancy expanded its education programs to Floyd County, City of Salem, and select City of Roanoke and Roanoke County schools. These field trips focused on the same topics as Bay Day, but geared towards the Roanoke River and the New River watersheds, hence the name River Days! Camp Bethel leads erosion games on the fields at the Preece farm. Clean Valley Council leads the stream school, where students take a walk through a stream to learn about clean water. Mountain Castles Soil and Water Conservation District assists with the stream schools. The Virginia Department of Forestry leads a natural resources talk, focusing on trees and taking students on a walk through the grove on the farm. The Western Virginia Water Authority leads pollution activities including "We All Live Downstream", where students learn about different types of water pollution and how they can help keep local streams and rivers clean. Click to watch a video of the first Bay Day in 2012 created by conservation easement owner Sky Preece.